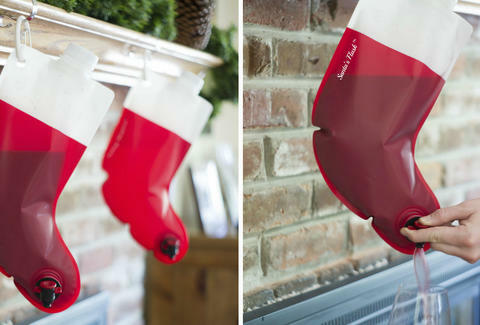 If your one wish this holiday season is to stay sane by subtly drinking your way into the new year, Santa has just the present for you: a traditional red and white stocking that also happens to function just like the bags in the boxed wine you're too fancy to admit you still drink. This remarkably practical decoration, called Santa's Flask, is produced by Party Flasks, a company that makes a whole line of these festive booze dispensers. The seemingly innocent decoration holds 2.25 liters of wine (around three bottles) that no one will ever know is Franzia if you hide the box. You could also fill it with Fireball, some ungodly homemade party punch, and probably water too? Here's a clarifying video of Santa's Flask in action. Maybe the video isn't particularly informative, but it certainly gets you into the holiday spirit. The stocking is currently available for $20 on Amazon. It's the best kind of gift: one that benefits the giver as much as the receiver. James Chrisman is a News Writer at Thrillist who is also filled with booze. Send news tips to news@thrillist.com and follow him on Twitter @james_chrisman2.